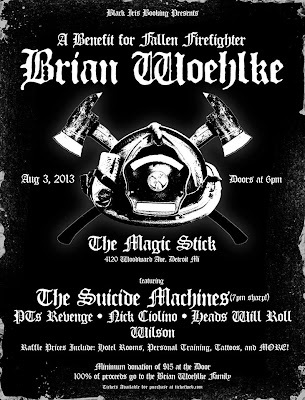 It is our honor to announce that this Saturday, August 3rd Hip In Detroit will be hosting a benefit show for the fallen firefighter and hero Brian Woehlke. To be able to help raise money for the family of a man who gave his life in service is the most amazing thing we have ever been asked to do. The fact that The Suicide Machines, Wilson, Heads Will Roll, PT's Revenge, Nick Ciolino, and Timmy Reynolds have joined up to play the event is just icing on the cake. It's time for the Detroit music scene to come together and show the world that we can support each other in our times of need. We are a community and a family that has big hearts and small wallets, but when we all come together it adds up. 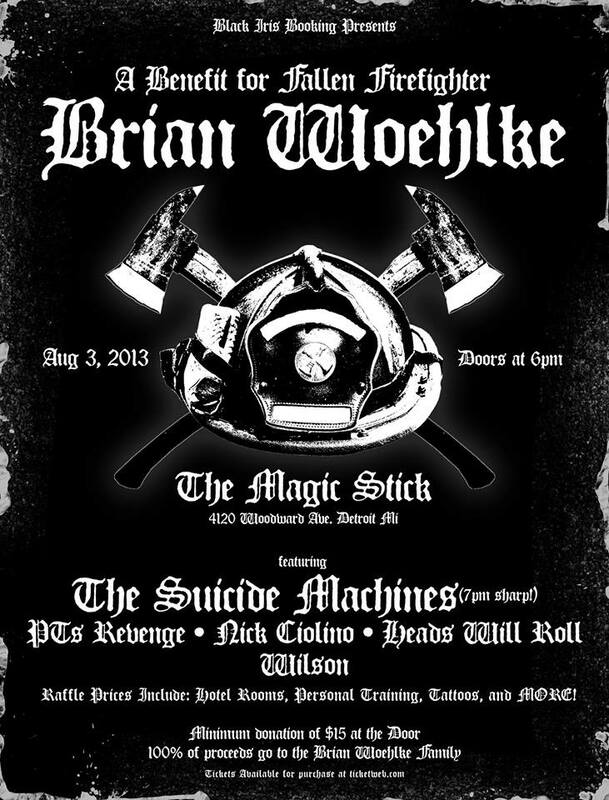 It's $15 at the door to get in, but 100% of the proceeds raised will go to Brian's family. You can also contribute by buying raffle tickets for $1 each the night of the show. All of our favorite local businesses have contributed prizes for the raffle. Some of them include a night at the Greektown Casino Hotel, personal training with Mark Culpepper, tattoos from Signature and Big Top, Dirt Fest tickets, a gift from Embarco Entertainment, merchandise from The End Grain Woodworking Co., a gift certificate for Green Dot Stables (by far one of the best restaurants in Detroit), and other prizes from Live Nation. Could you imagine contributing $1 to help a family in need and getting a new tattoo out of it!?!? Tickets for this great show at the Magic Stick can be purchase at Ticketweb.com or at the Garden Bowl prior to the date of the show with no service fees. Selling out a show and raising as much money as we can has never been more important! Bring your friends, bring your friends' friends, and make sure everyone buys at least one raffle ticket. We promise to be great hostesses and show you a good time!